I have been making one of my favourite products. 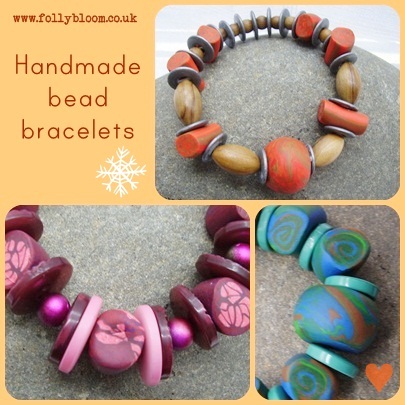 Folly Bloom’s polymer beads have been rolled, created, spliced and baked to make every bracelet totally unique. The beads are strung together on an elastic cord so they are very wearable and comfy. My oven has been working overtime and as soon as my bracelets are created they are listed. Hot out of the oven are these ones and can be found here. So cheers to ‘arm candy’ season!